The first time I saw Gravity in the cinema, the emotive kick was too great for me to pay much attention to the technical wizardry behind Alfonso Cuarón‘s modern masterpiece. So I went to see it again, this time with an eye on the film’s perennial backdrop — Earth. I wondered: Is it possible to recognize all the places that Dr. Ryan Stone (Sandra Bullock) and Matt Kowalski (George Clooney) fly over? 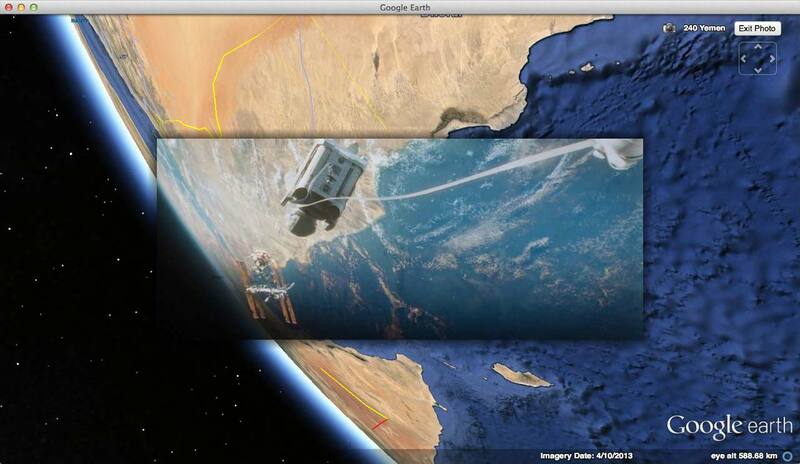 Is it possible to match Gravity‘s views of Earth pixel-for-pixel with the view in Google Earth? Can we use these found locations to reconstruct an orbit that matches the film’s timeline? What else can we infer from a close reading of this film’s Earth? 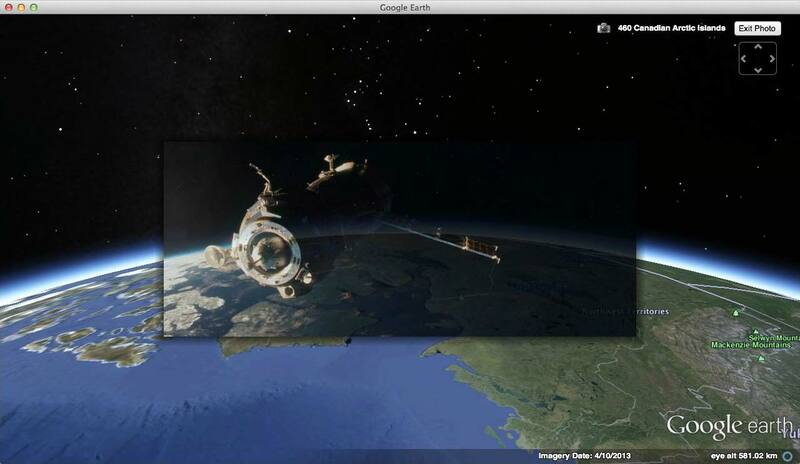 What can we conclude from placing those scenes from Gravity with an Earth backdrop in Google Earth? Gravity‘s daytime Earth is a highly accurate rendering. I was in almost all cases able to get a perfect match, not just for coastlines, but also for geographic features such as lakes, mountain ranges and forests. It is clear that the model they’ve used was derived from raw satellite imagery as an input, then embellished with clouds and other atmospheric effects. The rendering of Earth at night is geographically just as accurate, but city lights and lit roads are impressionistic rather than realistic. You can match up cities on Google Earth with those in the screenshots, but in specific cases where I am familiar with the geography (Egypt and Scandinavia) lit roads do not seem to match up with real roads, nor are city limits accurate. Viewing these georeferenced scenes in succession allows us to reconstruct a flight path for our protagonists. In broad strokes, we’re always orbiting in an eastwardly direction — as do the actual orbital paths of Hubble, The International Space Station (ISS), and Tiangong — though the exact path turns out to be scientifically impossible. 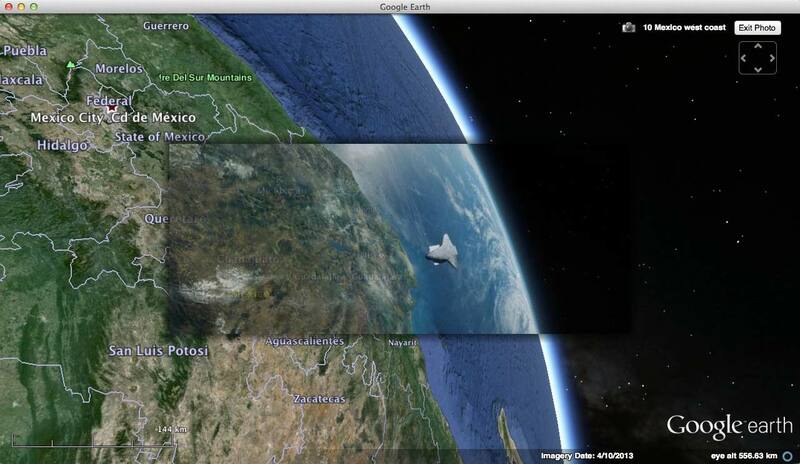 The very first Earth scene takes the Shuttle eastward across Mexico (#10, with a view of Mexico City, Cuarón’s birthplace) and into the Caribbean (#20-#100). After the Space Shuttle’s impact with space debris we turn a sharp left and head into the night along the US east coast (#110-#130), where our two astronauts are reunited. They return to the Space Shuttle over Southern Europe (#140-#200), meet the rising sun just past Egypt (#210-#230) and reach ISS over Yemen (#240-#260). We then again veer left, and follow the ISS across the East coast of China (#330-#350), past Japan’s west coast (#360-#370) and to the north of Sakhalin Island (#380), all while the Soyuz capsule fails to disengage from ISS. A geospatial plot discontinuity suddenly shifts us southward again, back to the Yellow Sea and over South Korea, where ISS is hit by the second round of debris (#390-#420). Soyuz finally catches up with Tiangong over northern Europe (#480-#510) and over the Black Sea (#520-#530). Tiangong is in turn hit by debris as it crosses into a new dawn somewhere past the Caspian Sea (#540-#620). Because of these constant northwardly turns to our protagonists’ orbital path, they never get to travel into the southern hemisphere, even though we circle the Earth. All of Gravity‘s scenes in fact happen between 2°N and 72°N; nor is there a gap in the timeline with room for a jaunt across the equator. From a strictly scientific perspective, this is problematic: All satellite orbits have to track a great circle, transposed only by the rotation of the earth during a satellite’s revolution. Thus all orbits must divide their time equally between both hemispheres. While the film’s collisions at various stages could conceivably send the protagonists into constantly new orbital paths, I don’t think this is plausible: Both the Space Shuttle and ISS remain substantially intact until late into the movie, and thus cannot have been given sufficient lateral impetus to significantly alter their direction of movement. Why diverge from hard science in this way? I’m sure poetic license is the reason: Perhaps the decision was made to only model the northern hemisphere, in order to get a bigger bang for the budget. Or perhaps they decided to give all major film markets a cameo role — we get a double helping of Europe, as well as a look-see of China, Japan, the US and the Middle East — all of them in the northern hemisphere. The largest continuity glitch, where we appear to suddenly backtrack in orbit, from past Sakhalin Island (#380) back to Korea, is closely paired with the next scene, in which a mystery landscape briefly appears (#390) before we pan back across the west coast of North Korea (#400). From that vantage point there is nothing remotely resembling the mystery landscape. We should just be seeing the Yellow Sea or China’s Shandong peninsula, which looks nothing like the landscape we see in the screen shot. And then there is the final sequence of images accompanying the disintegrating Tiangong, none of which I’ve managed to place. The final view of the Black Sea is a perfect match (#530), but immediately before that, the sea view is not identifiable (#520). After that, we could assume that Tiangong continues its trajectory across the Caspian Sea, but none of the landscapes we see in the film fit any real topology anymore (#530-#620). I can think of three reasons why this might be the case: 1) I can’t find them (please do let me know if you are able to georeference them). 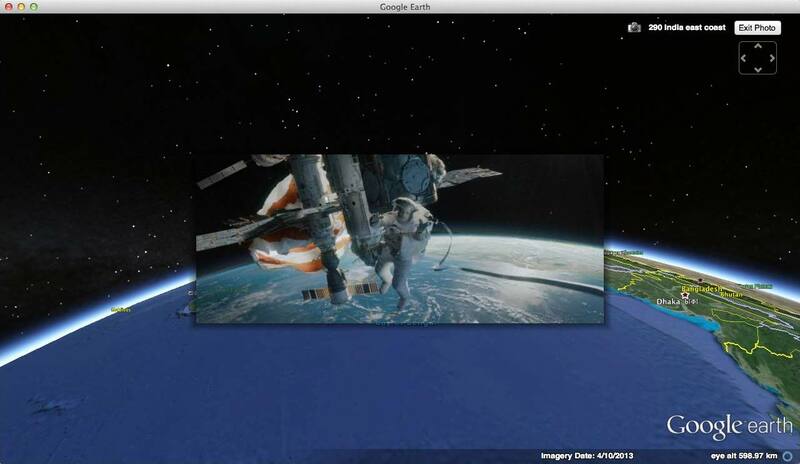 2) Because we are now losing altitude, Gravity‘s virtual Earth backdrop is no longer suitable. 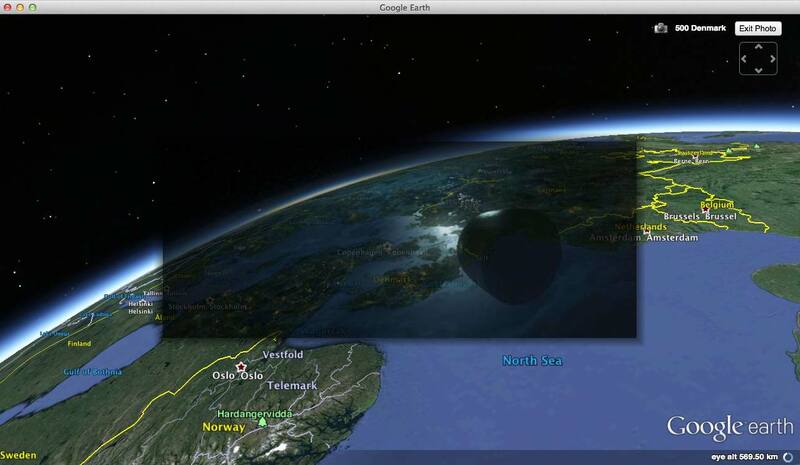 Perhaps for technical reasons it only works as a globe seen from 600km up. 3) Cuarón wants the protagonists to embody a universal quality about humanity — this is clear from all the symbolic references to evolution and striving in the last minutes of the film. Making the landing spot a specific place would detract from that sense of universality, so he switches to impressionistic landscapes rather than realistic ones as we get closer to Earth. Also this: The luxuriant lakeshore landscape we see at the end of the film is reminiscent of the prehistoric landscape that starts another science fiction classic, Kubrik’s 2001: A Space Odyssey. It would be an apt homage by Cuarón — both films take a giant leap forward for special effects in the service of science fiction realism. There are some other quibbles, which I believe others have already adressed. For example: The orbits of the ISS, Space Shuttle and Tiangong would never be so closely aligned. ISS flies at around 400km above Earth between 52°N-52°S, Hubble sits at 560km above Earth between 30°N-30°S, while Tiangong sits at 350km, orbiting between 42°N-42°S. 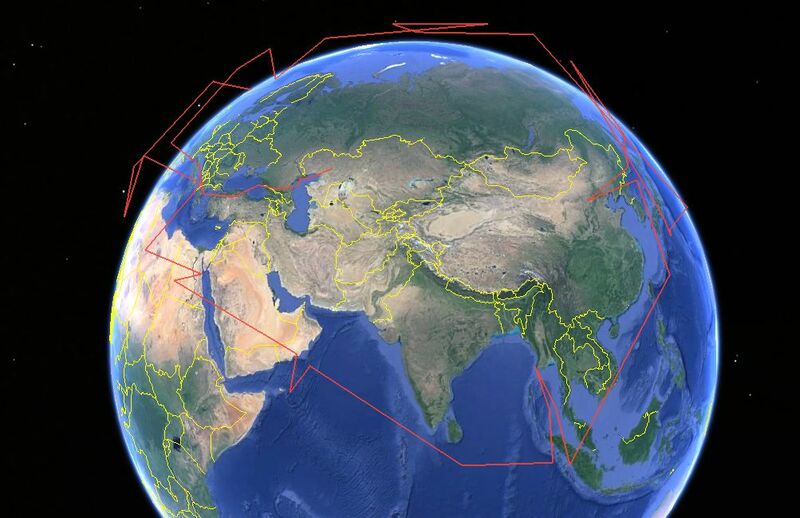 Even if these satellites were orbiting at nearly the same height, they paths would constantly diverge. None of this detracts from my enjoyment of the film. Science fiction has a long and proud history of rearranging the facts to make for a better story. In The Fountains of Paradise, for example, Arthur C. Clarke shifted the entire Island of Sri Lanka 7° southward so that it could straddle the equator and host a space elevator. Finally, in case you’re wondering about margins of error: In almost all of the film’s shots the equivalent field of view in Google Earth is between 50°-60°; the camera’s point of view is thus at most a few hundred meters removed from the action — never hundreds of kilometers. So the kinks in the trajectory are far larger than any possible margin of error in the positioning of these screenshots. … [T]he official Korean Central News Agency released an unusually showy photo of Kim huddled with generals over what the caption described as “plans to strike the mainland U.S.,” complete with a chart in the background depicting trajectories of North Korean missiles hitting American cities. I’m on the road so this will be brief: The paper map visible in that photo shows the Pacific on the left and the continental US on the right, with missile trajectories drawn from North Korea to a number of locations in the US, including Hawaii. The only problem: Missile trajectories from North Korea to the continental US fly over Kamchatka and Alaska… because the Earth is not flat. North Korea’s military probably knows about great circles, but its propaganda department obviously failed geography. 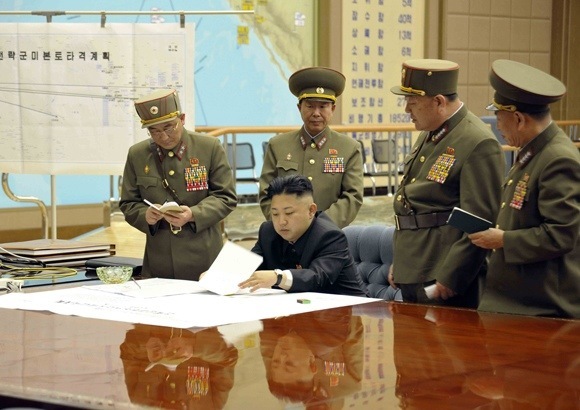 Or perhaps the photo above depicts Kim Jong-un providing on-the-spot cartographic guidance to his aerospace engineering team, and the problem will by now have fixed itself. 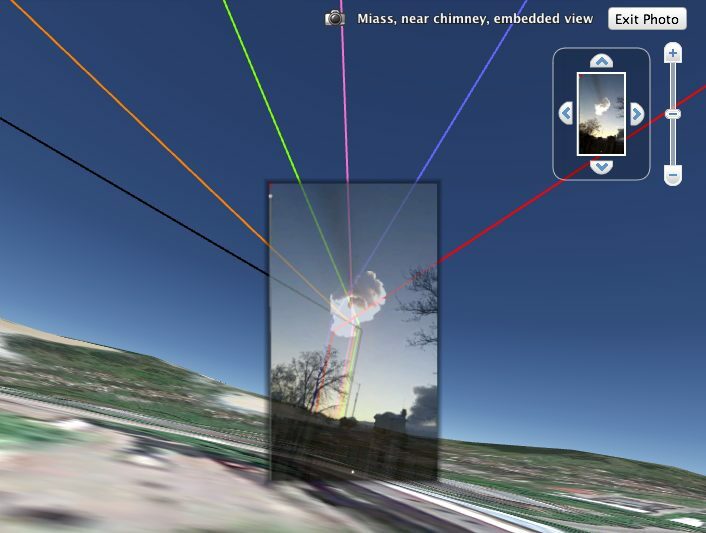 Briefly, here’s what I’ve done: Initially, Google Earth allowed us to locate and measure YouTube videos to determine the angles of shadows, which enabled trajectory calculations, which have now been visualized in Google Earth. These trajectories can in turn be inspected visually from the vantage point of any number of geopositioned videos, resulting in an interesting additional method for verifying the accuracy of diverging trajectory calculations, short of going to these locations and making measurements in situ. Before I do a walk-through of the trajectories and the videos, an exciting piece of news: A week or two ago, Jorge Zuluaga and Ignacio Ferrín — the duo calculating the trajectory of the meteoroid at the Physics Institute at the Univeristy of Antioquia in Medellín, Colombia — got in touch to discuss my original blog post on the use of Google Earth and YouTube as an ad-hoc sensor network for raw data on the meteoroid. They had taken my method and given it a rigorous mathematical make-over, aggregating information from four especially useful videos, including those contributed by commenters on Ogle Earth in the days after the event. From this trajectory, they calculated an orbit, concluding that the Chelyabinsk meteoroid was an Apollo-class Near Earth Asteroid. In a classy move, Jorge and Ignacio asked me to co-author the paper they were writing, for having originally come up with the method which they then greatly improved upon. In the ensuing collaboration we identified additional useful videos, worked on the included Google Earth visualizations, and honed the prose. The paper, The orbit of the Chelyabinsk event impactor as reconstructed from amateur and public footage, has just been published to arxiv.org (here’s the PDF). The KMZ file discussed in this post (download and open in Google Earth) is the one attached to the paper. Note that the paper makes a point of thanking several commenters by name for their contributions to the original blog post. Citizen science FTW! Accuracy I: The NASA trajectory (in red) is derived from coordinates courtesy of Sebastien Pauleau, who calculated them from a close study of the trajectory map NASA released here, modeling the result on a WGS84 datum globe. He reports that while the accuracy of his model is calculated to 4 decimal points (an error of within 10m around Chelyabinsk, the limit of Google Earth’s accuracy with respect to the positioning of its imagery), it’s not possible right now to know how accurately NASA plotted its map. The Colombian trajectories (pink, green, black, orange), are also plotted to 4 decimal points, while the Czech results (blue) are plotted to 3 decimal points (within 100m), though of course the real error bars are a lot larger in at least all-but-one case (or else all the calculated trajectories would all have to lie within 100m of each other). The Colombian coordinates were shared directly; the Czech coordinates were published here. Landing sites: We know that a good-sized chunk landed in Lake Chebarkul, and in the original coarse calculation I used that information as an input, fixing the lake as an endpoint for the trajectory. None of these more accurate “pro” trajectories make this assumption, and it is clear from subsequent news articles that the landing area extends beyond and around the lake. As a result, all calculated trajectories overshoot Lake Chebarkul, intersecting Earth just past the town of Miass. 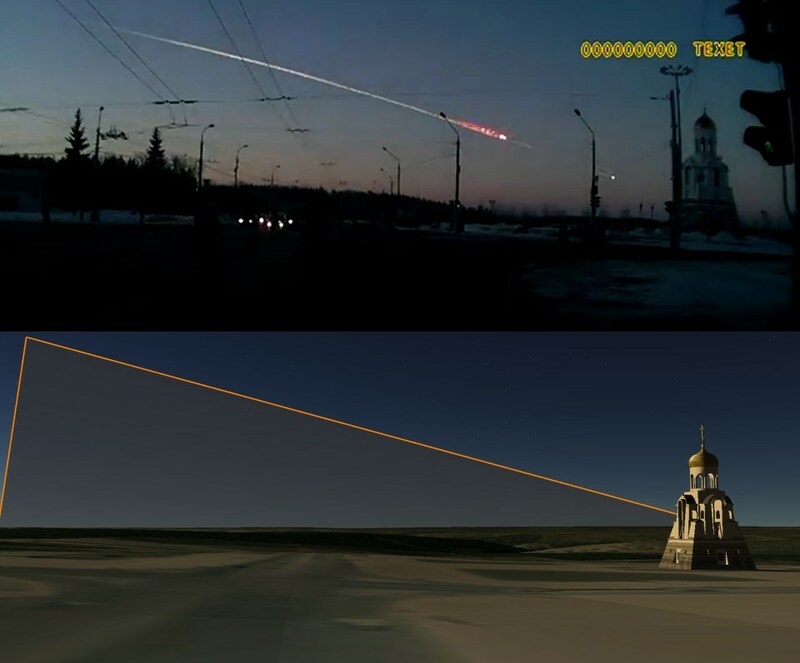 Accuracy II: Because all these calculated trajectories are straight lines, there is an important caveat: From having looked closely at many geopositioned photos and videos, it seems clear that the real trajectory of the meteoroid changes as a result of the main explosion just south of Chelyabinsk. The post-explosion path seems to aim at bit more steeply at Earth, and may even have changed its azimuth (direction). Also, as the meteoroid slows down through atmospheric friction, it will begin to “fall” in a more classic arc. No one straight line can model such a more complex path with complete accuracy. As a result, I think all current calculated trajectories overshoot the real landing site. I suspect most of the meteor mass landed between Lake Chebarkul and Miass, not beyond Miass. There are no videos from Miass showing a path flying overhead, though the calculated trajectories do assume such a path. One Miass video in particular (“Miass, near chimney” shows the contrail almost perfectly head-on, suggesting the the main part of the meteoroid landed in front of the viewpoint (towards Chebarkul). 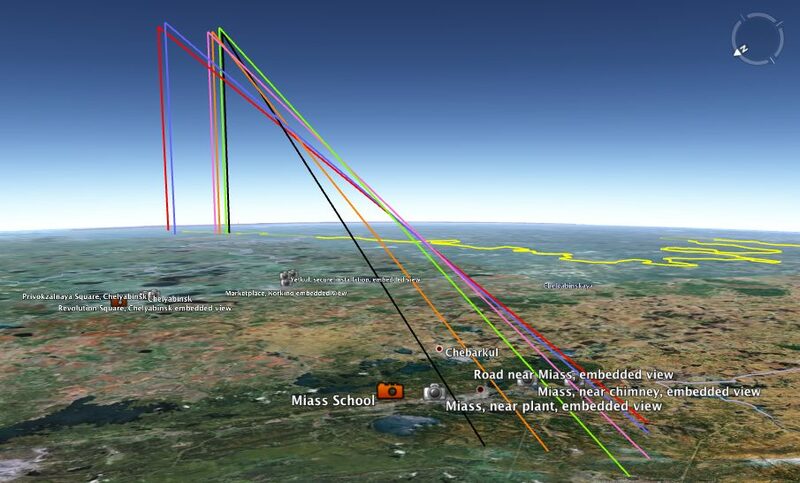 Other viewpoints in Miass (“Miass, near plant” especially) suggest that some of the calculated trajectories do a better job of modeling the pre-explosion path, while others are more accurate for the latter part of the path. It’s important to note that around Miass, because the meteoroid was so close to Earth, very small differences in the calculated path can have a very large perceived effect, with changes of just a few hundred meters radically altering the perceived view. From what I understand, it’s possible to construct even more accurate trajectory models that do not assume a single straight line, and I think this is where astronomers’ efforts will lie in the future. Accuracy III: One word of caution about the geopositioned screenshots in the KMZ file: It’s not possible to accurately compensate for fish-eye effects and other distortions in Google Earth beyond basic field-of-view adjustments, and the videos do not always contain sufficient environmental references to precisely measure the heading, tilt and roll of the camera viewpoint. So these videos cannot be used for detail work, though they do work well when trajectories diverge greatly, as is the case near Miass. Interact: The KMZ file is fully editable, so feel free to edit the embedded screenshots (Right-click an item in the Places sidebar, select Get Info) to see if you can get a better fit against the calculated trajectories. 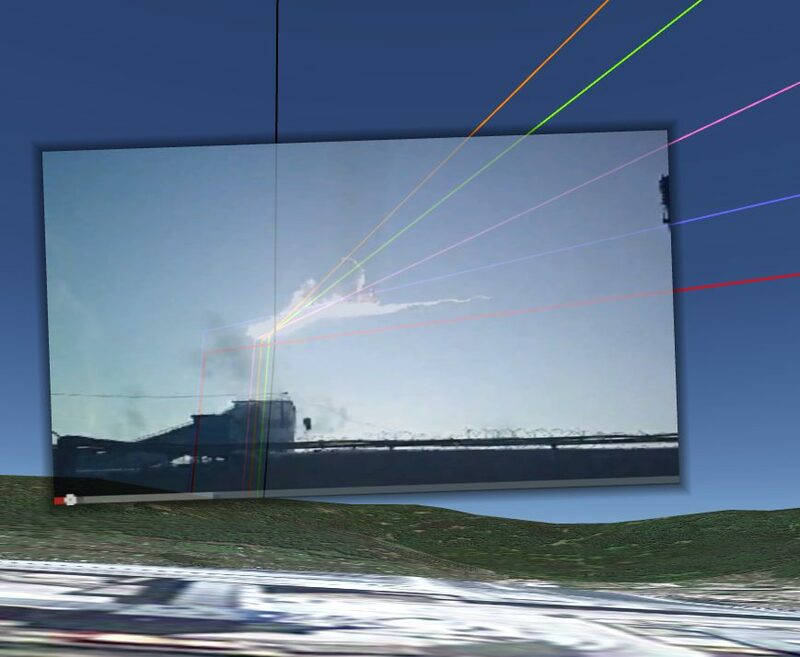 Although it is tempting, I tried not to align the meteoroid path in the video capture with the calculated trajectories in Google Earth, relying instead on clues from the surrounding environment. It’s possible to infer quite a lot from aligning the placement and angles of objects in the geopositioned video capture with imagery on the ground. Interact II: Do play with the opacity slider at the bottom of the Places sidebar (click the gradient button, if you need to); this makes it much easier to make comparisons (watch the video above to see how). 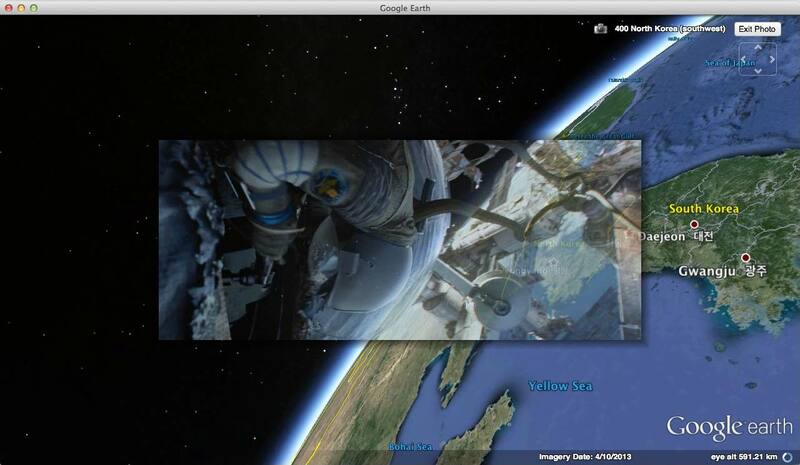 Finally, if you’re wondering how I managed to fly around so smoothly in Google Earth — I use this to navigate 3D space. Two weeks on, Ogle Earth’s Chelyabinsk meteoroid story has led a interesting life. In the first hours after it went live in the early hours CET of Feb 16, it was first tweeted by Bad Astronomy’s Phil Plait and then more broadly by the astronomically minded community. After a day, the wider tech and science crowd found it. Two days later, mainstream media discovered it. A week later, it saw a second wind as a meta-story about citizen science. It’s received a respectable 100,000 visits so far, not quite making it Ogle Earth’s most popular story ever (that honor still goes to Finding Osama Bin Laden’s Abbottabad mansion with Google Earth from May 2, 2011). However, it is by far the most commented story in the blog’s history, with around 340 comments to date, many making real contributions improving on the initial approximations. Thanks especially to early work by Sean Mac, SebastienP, Robin Whittle, liilliil and the other Russians who provided help with language and localization. If this article is an example of citizen science, it’s important not to overlook the collaboration that went on in the comments section. I was actually traveling in Africa for most of the past two weeks, not able to do more than moderating the comments passively. 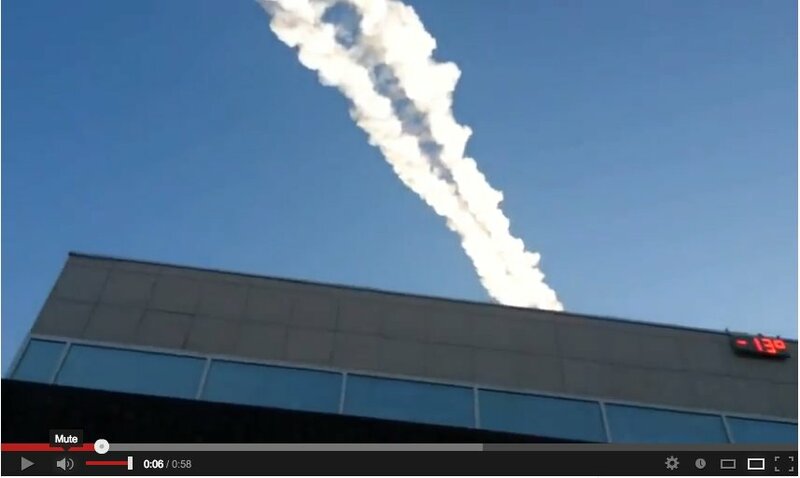 There is also a team at the Astronomical Institute of the Academy of Sciences in Ondrejov, Czech Republic, that used the same or similar viral videos and Google Maps to calculate a trajectory for the meteoroid. Their results were posted as an Astronomical Telegram by the International Astronomical Union. They give a set of 6 position fixes so I’ve visualized these data points in this KMZ file for Google Earth. 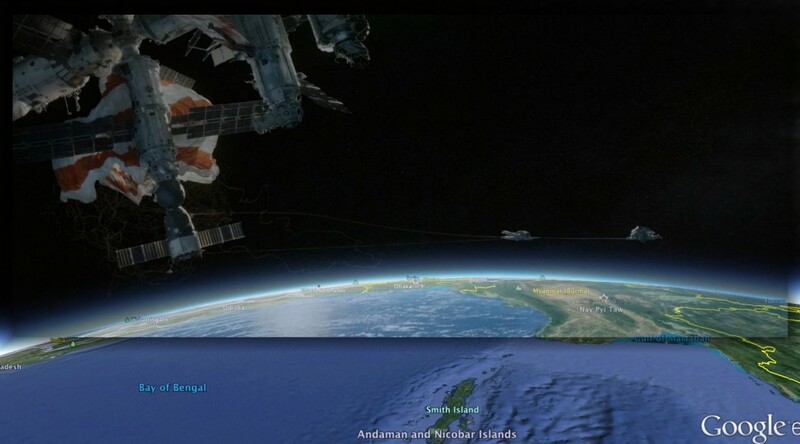 A team at the Cooperative Institute for Research in the Atmosphere (CIRA) at Colorado State University is calculating the trajectory from a totally different perspective — from space, using the vantage point of two different weather satellites. It will be interesting to see how closely their results correspond to those from the ground. And finally, on March 1 NASA released its own calculations, based on “U.S. Government sensors” that for the moment shall apparently remain nameless. NASA’s data fixes a position for when the meteoroid reached its maximum brightness, given as “54.8°N, 61.1°E” at a height of “23.3 km”. These figures are given to three significant digits, or to the first decimal place; I don’t know if these are at the limits of the instrumentation used or artificially downgraded measurements, but assuming that these are natural bounds for error, I visualized this location in Google Earth as a rectangle at a height of 23,300 meters, delimiting the area between 54.75°-54.85°N and 61.05°-61.15°E. You can download the resulting KMZ file for Google Earth and use it together with the two (one and two) existing KMZ files from the original article. 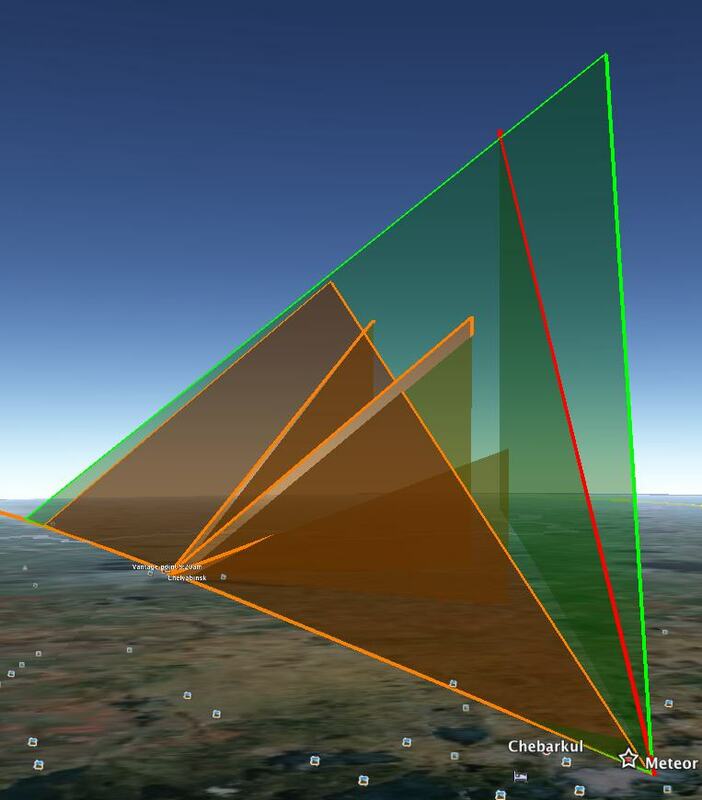 As you can see from the resulting interaction with the original KMZ files, NASA’s calculated rectangle neatly intersects with the calculated inclined plane along which the meteoroid was observed from Revolution Square in Chelyabinsk. The red line was my most likely trajectory, with the green line as an upper bound. That is a good match indeed! If anything, I think NASA’s results could be nudged a little northwards, considering how the very accurately geopositioned video from Yemanzhelinsk resolutely places the trajectory slightly north of the zenith there. If you add the Czech results (linked to above), you find a ground path that is practically identical to the red line (they have the same azimuth) but with an angle of attack that is shallower than the one I calculated from the vantage point in Revolution Square. As a result, their trajectory appears at first blush to overshoot the main (or a major) crash site at lake Chebarkul, though of course it is also plausible that meteoroids at the end slow down and start falling to Earth. The shallower trajectory does place their path further away from NASA’s calculated rectangular “window”. I’ll continue to update this post with improved scientific results as they arrive. Stay tuned! Like many others, I was absolutely astounded by the meteor strike over Chelyabinsk when I woke on Friday morning. One silver lining to our self-surveilling society is that an event of this magnitude is certain to get caught on the myriad of always-on dash- and webcams. I for one could not get enough of the videos. That place is easy to find — it’s Revolution Square at the absolute center of Chelyabinsk, looking almost directly south. 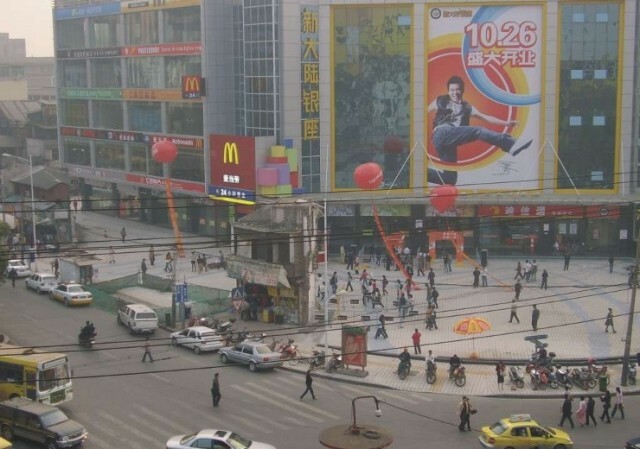 It is also easy to measure — the distance between the two central light poles is 32 meters, as per a quick measurement in Google Earth, while the five lanes of traffic going right to left (west to east) measure 19 meters. From this it is easy to estimate the height of the light poles to be around 12 meters — an estimate corroborated by numerous panoramas in Google Earth showing people next to these lamp posts, giving us added data points. 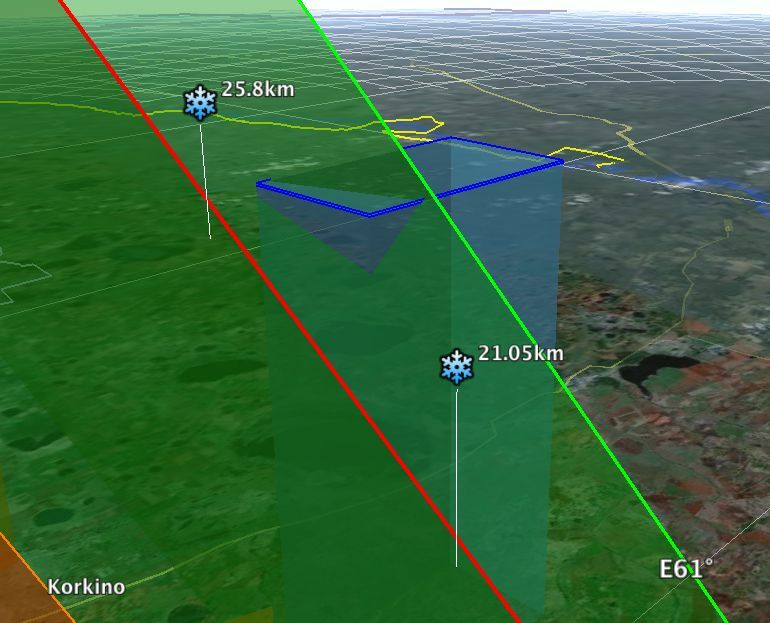 This allowed me to draw an inclined plane in Google Earth that should include the meteor’s path, though it does not allow me to know the distance of the meteor from central Chelyabinsk, nor its speed. However, we have more clues. 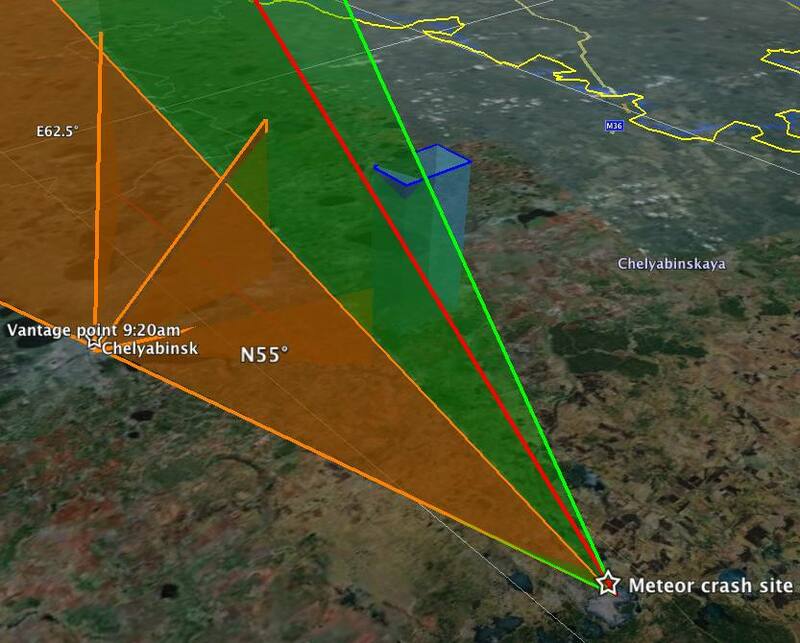 We know a fragment of the meteor landed in Lake Chebarkul, roughly 70km WSW of Chelyabinsk. Gratifyingly, the inclined plane generated from the above video intersects with the crash site. Also useful was the estimate by the Russian Academy of Sciences that the meteorite hit the Earth’s atmosphere at around 50,000 km/h, shattering at an altitude of 30-50km. If that was the rough speed of the meteor as it burned up in the video, then the 4.7 seconds between the first and last shadow measurements would have seen it travel 65 km. Fitting a 65km line between these two lines of sight allows us to draw a straight line path for the meteor towards the crash site, with the first measured time yielding a height of 29km, which is the moment the meteor first brightened enough to give a clear shadow. 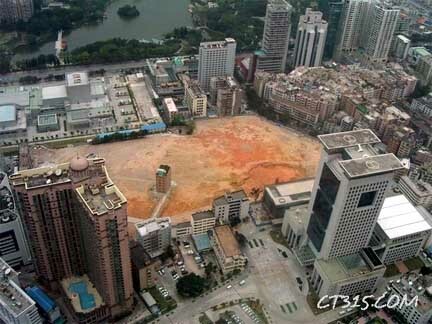 Download the visualizations for this as a KMZ file to open in Google Earth. Do play with the opacity slider of the overlay to check the alignments yourself — it’s most of the fun. How does this data square with the Meteosat 9 image that has being doing the rounds? At first glance, not well: Overlaying the image in Google Earth and aligning the border with Kazakhstan shows a 240km contrail that appears to end some 75km to the ENE of Chelyabinsk, even though the path when traced on the ground also leads directly to Lake Chebarkul. At first, I thought the image might have been taken 5 minutes earlier, before the meteor streaked straight across Chelyabinsk proper, because the image’s metadata gives us a time of 3:15:00Z, or UTC, which is 6 hours behind Chelyabinsk time. But no meteor is going to take 5 minutes to traverse 75km, so we’ll just have to live with the time discrepancy. Webcams are not atomic clocks. The version used in the overlay is an enhanced view of this image, taken from the same angle. 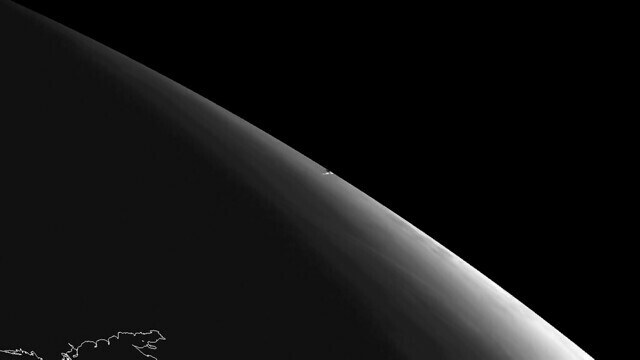 (The blacked-out upper right-hand corner of the overlay is behind the horizon as seen from Meteosat 9.). 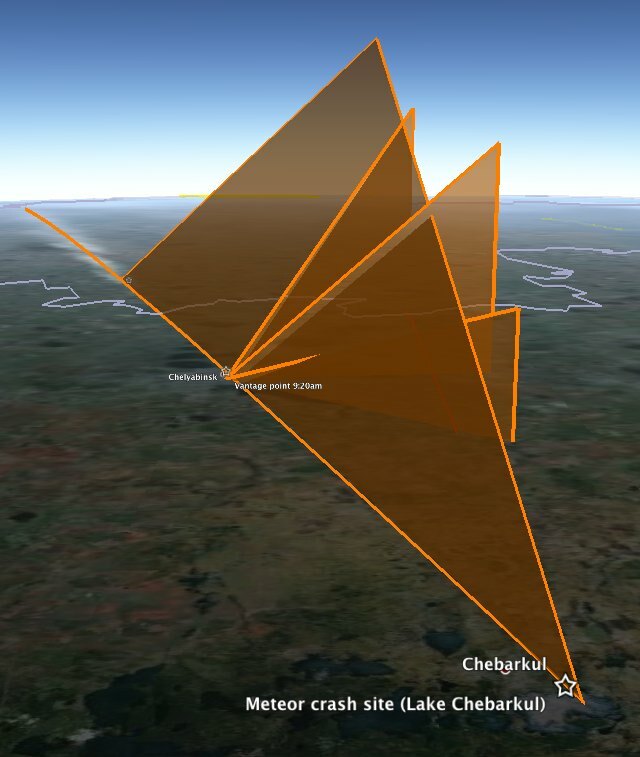 If you simulate this view of Chelyabinsk in Google Earth, you see that in fact, the contrail aligns quite nicely over Chelyabinsk considering that it would be 30km high and at such an extreme angle over the horizon. 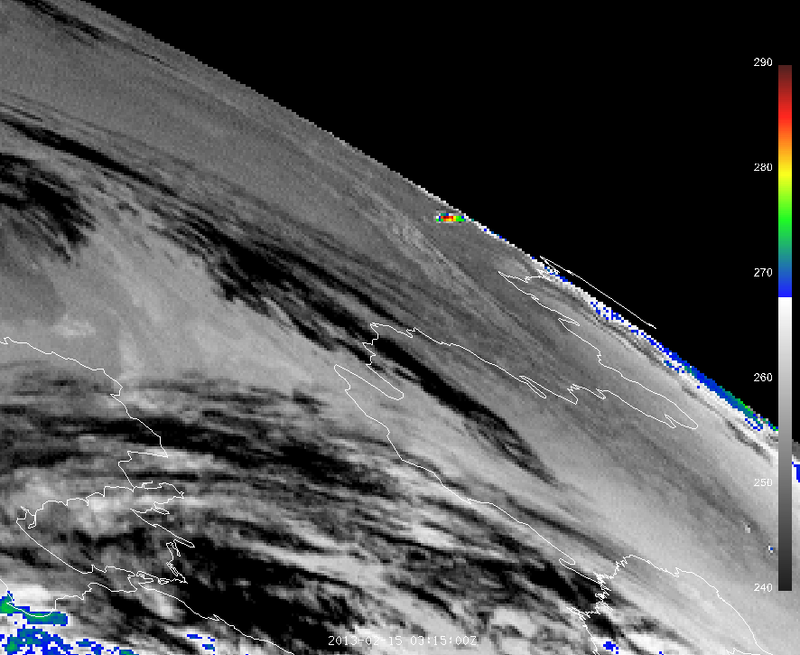 So the 4.7 seconds of maximal brightness (with contrail) do get to happen just south of Chelyabinsk proper, as per the above video, and without contradiction by Meteosat 9. I feel this post would not be complete without some big caveats: I am not a trained scientist; I don’t know if meteors travel through the atmosphere in straight lines or at constant speeds (I assume they don’t, but that it doesn’t matter for back-of-the-envelope type calculations). Still, it is satisfying to know that with judicious use of Google Earth, YouTube and Photoshop you can get quite far in the meteor simulation game. I can’t wait to see what the professionals come up with. 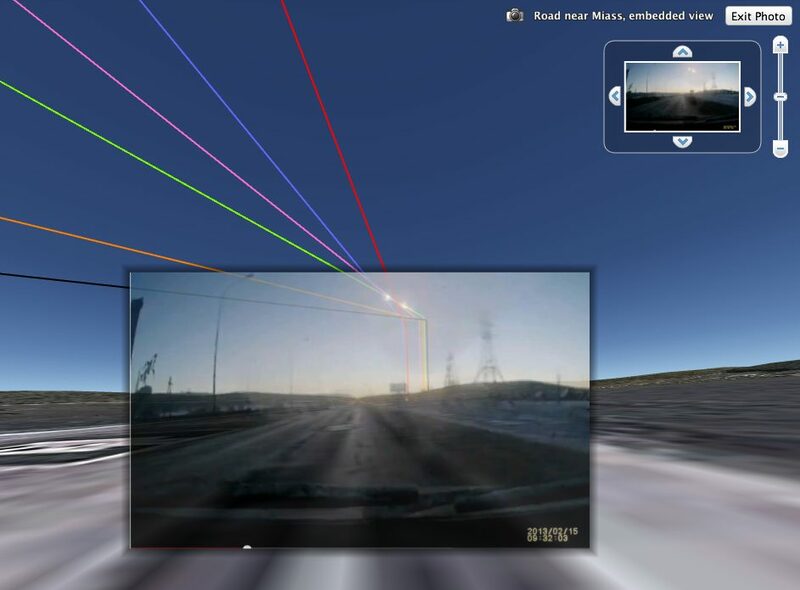 UPDATE 2013-02-16: Via SebastienP in the comments comes another triangulation, comparing the calculated path from the KMZ file with the view from another dash cam. It holds up pretty well! 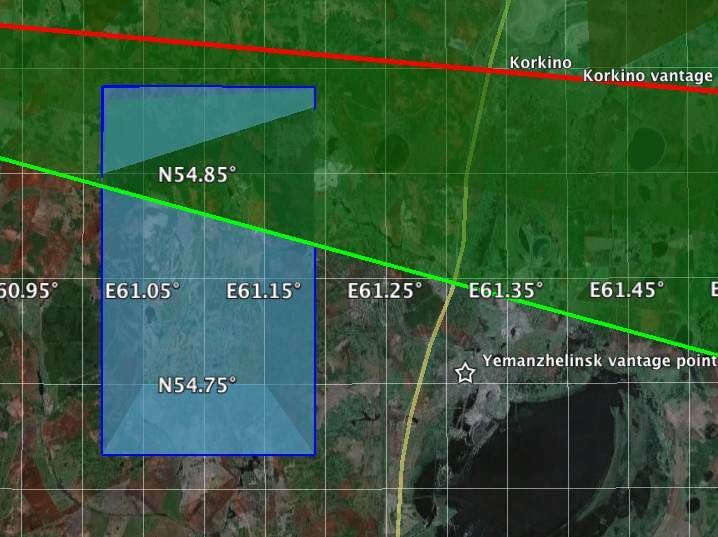 UPDATE 2013-02-17: In this comment, some smart calculations by Sean Mac are confirmed by a video he’s found showing the contrail crossing almost exactly above the southern suburb of Yemanzhelinsk. I found the exact vantage point of the video he references in Google Earth by connecting this Panoramio photo to this view in the video. 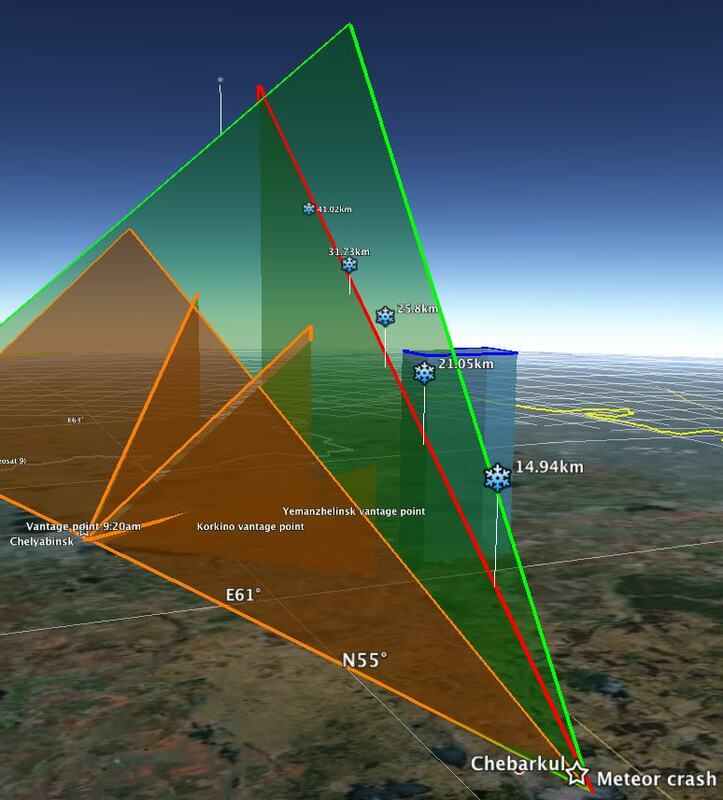 This suggests the meteor’s trajectory towards Earth was higher and steeper along the inclined plane of sight derived from the central Chelyabinsk vantage point than the initial calculation suggested. That’s not surprising, as that calculation was based on an initial estimate of the velocity by the Russian Academy of Sciences, which now appears to have been on the low side. I’ve now added a second path for the meteor in Google Earth, together with the location of the vantage point in Yemanzhelinsk, in this KMZ file. Open it as a complement to the first KMZ file to see what I would consider to be an upper bound (green) for the trajectory along the same inclined plane, with a new likeliest path (red). “Looking up” in Google Earth from the vantage point in Yemanzhelinsk (I can because I have a 3D mouse from 3DConnexion), I get a very similar angle of view of the contrail when framed by the NNW axis of the buildings on that square. Yesterday, Wired’s usually reputable Danger Room blog posted an article on “China’s mystery complex”, titled “What Did Google Earth Spot in the Chinese Desert? Even an Ex-CIA Analyst Isn’t Sure”. 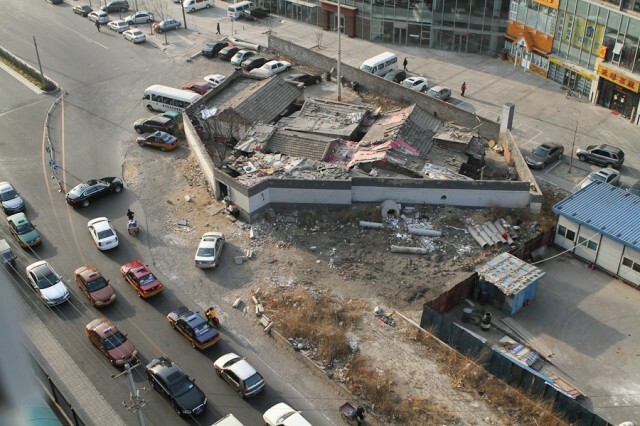 But even this old analyst is having trouble ID’ing the objects he found in the overhead images of Kashgar. “I haven’t the faintest clue what it might be — but it’s extensive, the structures are pretty big and funny-looking, and it went up in what I’d call an incredible hurry,” he emails. So he’d like your help in solving this little mystery. As a Google Earth user and blogger, and having traveled to Kashgar and written about the city and its surroundings, I was certainly intrigued, so I decided to take a look. 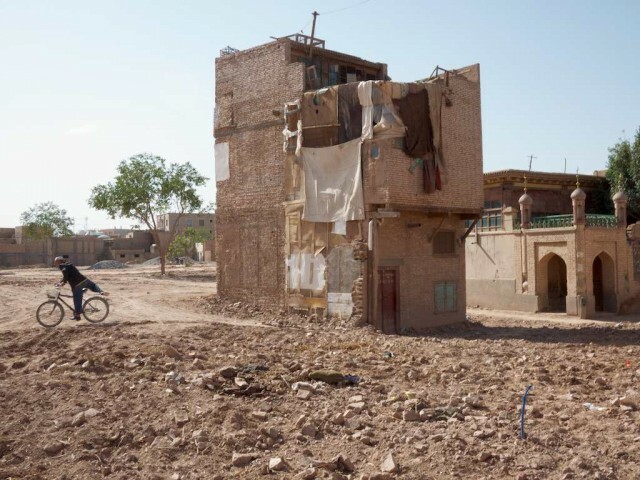 View Kashgar in a larger map, with explanations. 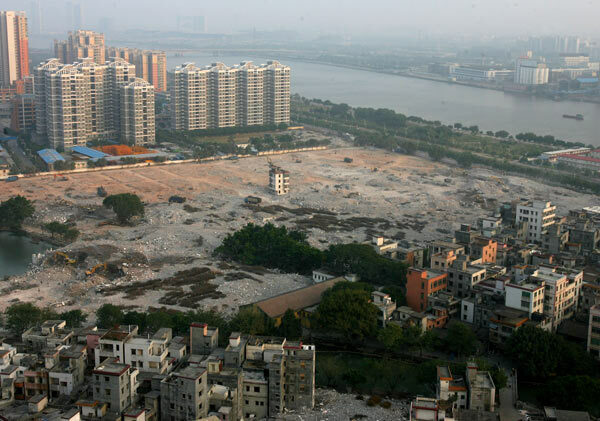 In May 2010, Kashgar was selected as a special economic zone by the Chinese government, which means that, just like Shenzhen and other places before it, it is in for a wild ride on a scale not often seen outside China. 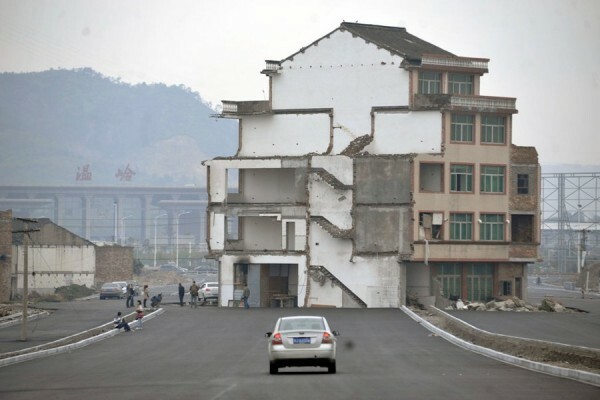 I’d be surprised if there wasn’t anything massive being built in Kashgar right now. Kashgar’s economy is growing at around 15-20% per year, and it is perfectly placed for cross-border trade with the central Asian republics. 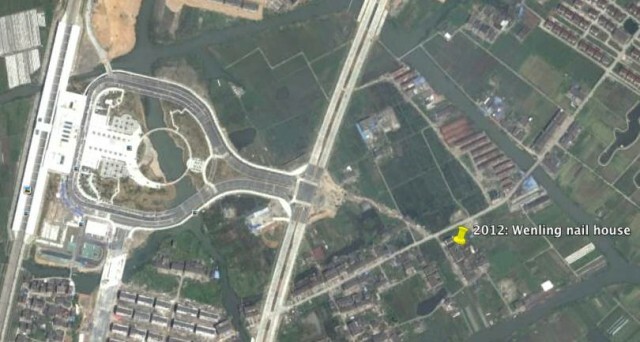 The complex in question is conveniently being built just to the northeast of the very modern Kashgar airport, very close to a reservoir which I drove by on an excursion to nearby ruins (also marked on the map). The railway from Urumuqi to Kashgar veers into Kashgar just south of the reservoir, and would be perfectly positioned for an offshoot into the industrial zone. This complex is not at the far edge of some small desert town; it is located on prime real estate near transportation hubs in a rapidly expanding trading and manufacturing center that was once a major waypoint on the Silk Road. It would be the absolutely worst place to build a secret base. 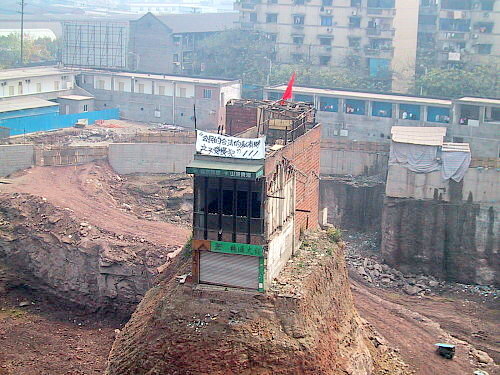 Anybody with a visa for China can fly, drive or train it to Kashgar. There are no restrictions to travelers into the region, unlike in Tibet. In fact, landing at the airport, I had a wonderful view of the slopes on which this complex is now being built. Fly into Kashgar on one of many daily scheduled flights and you’d know right away how work is progressing. In sum, I was disappointed. 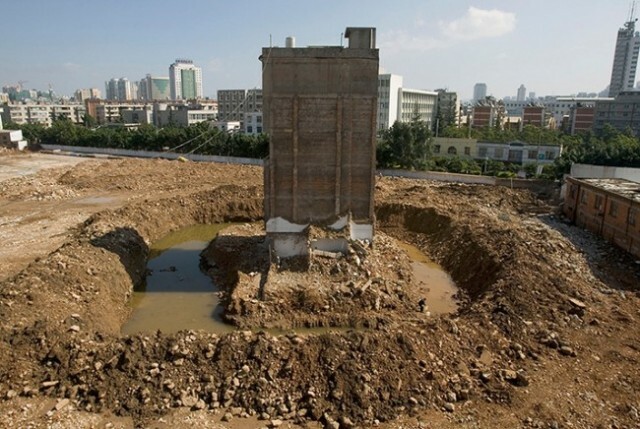 Not with the Chinese for failing to construct a mystery complex, but with the gullible reporter, who should at the very least have gotten a second opinion before letting loose on the Internet a retired analyst with an overactive imagination and no on-the-ground knowledge of the area. I left a comment to that effect. This story thus reveals more about us than about China. It is above all a story about technology racing ahead of our ability to put it into context. We are overawed by the notion that we can observe any place on Earth in high resolution, but we lack the tools to understand this power and the limits of this power. Into this cognitive vacuum we pile on conspiracy theories. Any absence of information suddenly requires a cover-up. Comments to the original Danger Room article betray an amazing appetite for conspiratorial beliefs that are incompatible with even a passing knowledge of how satellite imagery is collected. And the story also reveals how many in the West continue to see China as an oriental mystery opaque to westerners, fair game for wild conjecture. But it’s not. Those days are long gone. Here be no more dragons. China is knowable. 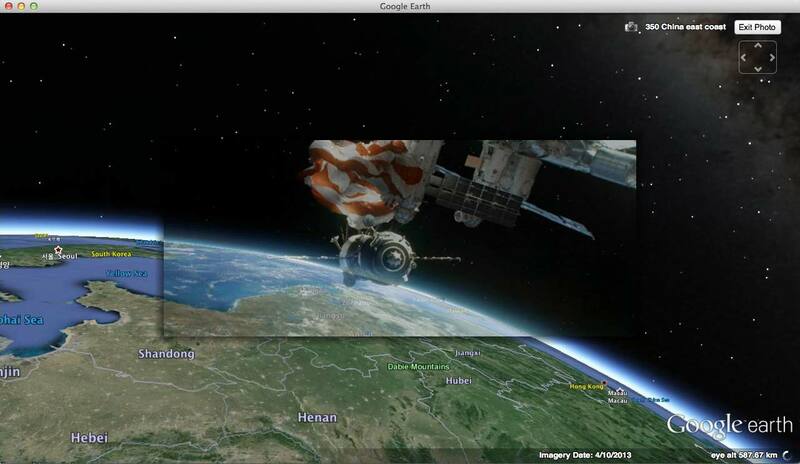 Just not from Google Earth alone.